Image caption Could the US really help defend Taiwan against China? Is a new crisis between China and Taiwan looming? How do these growing tensions relate to the deepening differences between Washington and Beijing? And has President Trump contributed by undermining the long-standing "One China" policy pursued by his predecessors that was the foundation of the rapprochement between China and the US in the late 1970s? The incursion by Chinese warplanes on Sunday, crossing a maritime line separating Chinese and Taiwanese waters, is the most serious such incident for years. The duration of the incursion - some ten minutes - suggests it was no mere navigational mistake. Taiwan scrambled aircraft to intercept the intruders. Taiwan's President Tsai Ing-wen has called for Chinese warplanes that cross the maritime line to be "forcefully expelled". Could a US-China conflict happen? Taiwan - of course - is seen by Beijing as an inseparable part of China; its separation from the motherland merely a temporary phenomenon. China's President Xi Jinping warned at the start of this year that unification remained China's ultimate goal irrespective of the differences between their two political systems. He made it clear that China would not "abandon the use of force" and that it retained the option "of taking all necessary measures." China remains preoccupied with Taiwan. Indeed many US strategic analysts see the re-establishment of Beijing's control over Taiwan as the primary goal driving its military modernisation programmes. And an important aspect here is what is interpreted in the West as Beijing's anti-access and area denial strategy. In simple terms, this is the development of longer-range and more accurate weapons systems to push US forces (who might be coming to Taiwan's aid) further out into the Pacific. Last month - in an effort to signal that it will continue to assert its rights of free passage - the US sent a destroyer and a Coast Guard cutter through the Taiwan Strait between China and Taiwan. This inevitably upset Beijing and was equally seen by the Taiwanese as a show of support. Washington's efforts to demonstrate what it terms its "freedom of navigation" is highly controversial in Beijing, given its expansive claims to waters in the region. It comes at a time of rising Sino-US tensions with differences over trade, technology, and China's growing military assertiveness. Add in unease in Beijing over the slowdown in its economy, which many China watchers fear could lead to President Xi pursuing a more nationalist stance, and it is easy to see why fears are growing about the course of the US-China relationship. This weekend's incursion by Chinese warplanes is a reminder of the dangerous Taiwan dimension as well. It was not always thus. Back in the late 1970s and early 1980s the US established what became known as its "One-China" policy. Image caption Has Donald Trump changed US policy toward Taiwan? It recognised the Communist-run government in Beijing as the country's sole legitimate government. It acknowledged the Chinese position that there is but one China. Taiwan is thus part of China. It downgraded ties with Taiwan. But equally it made it clear to Beijing that the US would "consider any effort to determine the future of Taiwan by other than peaceful means" as being of "grave concern to the US". 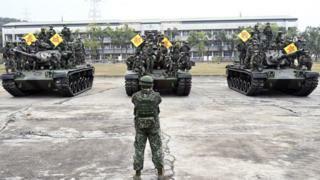 The US would support Taiwan's self-defence and left open the possibility of coming to Taiwan's aid if it were attacked. What is the 'One China' policy? But is this policy really credible in the face of China's growing military capabilities? And will Taiwan continue to be happy with the mere trappings of independence rather than the real thing? Is the Trump administration sending the wrong signals to Taiwan? Mr Trump, for example, became the first president-elect since 1979 to speak directly to Taiwan's president. Some in his administration want to revisit the whole "One-China" policy. Beijing has seen this US president abandon arms control agreements and alter the diplomatic status quo in the Middle East over Jerusalem and the Golan Heights. They may well fear a similar shift in the US policy towards Taiwan.